We got the match results today and have a match... actually 2 matches! Yup that's right both Anna and Lily are matches for Abby's bone marrow type. Very rare that both siblings are matches. The bone marrow transplant (BMT) team will do some further blood tests on both girls to see who might be a better match and then we'll go from there. We have an appointment with the team in early February to get all of the details and hopefully have a better understanding of the timeline too. In other news, Abby is still in the hospital, still in some pain (but much less, just depends on the day), off of the morphine, and still has an ANC of 10. We have to wait until her ANC is 100 to leave and I think they want her pain to be manageable with oral medication too. Hopefully we will continue to move in the right direction. 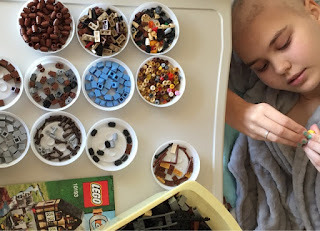 We watch a lot of movies, do some crafts and she has built a few lego kits that friends have brought in. The legos have been a nice distraction and it is great to see her actually use her brain a bit more than just watching the cooking network. Since we are probably here for a while longer I decided to buy her a big kit for her to work on. It has 1600 pieces so that should keep her busy for a while! Today was a busy day actually. Abby finally got her head shaved as the hair loss was ramping up again and she was getting tired of the mess of hair. We also changed rooms to a room with a tub so that she can take some baths now. That is a huge help for her right now so we were very happy. We actually have the same room that we had for the initial stay and it is a very nice room with a great view.